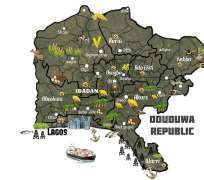 And when that time comes, no-one and no group of people will be in a position to say "no" to the rise of the mighty Oduduwa nation. It is at that time that we shall expand our borders and re-establish the ancient boundaries. For now we seek only to nurture and protect that which we deeply cherish: nothing more and nothing less. For now we seek only to confirm the incontrivertible fact that we have a role to play in God’s greater plan for the final emancipation of the African continent: nothing more and nothing less. For now we seek only to establish the fact that we are a people that are not only close to the heart and seat of Almighty God Himself, but we are also a people whose irresistible and manifest destiny it is to lead mother Africa and all her beautiful peoples to the citadels of abundance and excellence and to the pearly gates of the Promise Land. If we cannot have these things then we may as well say that the unfruitful and barren "marriage" that two extreemely cruel, unfeeling and obviously sadistic englishmen by the names of Lugard and Harcourt decreed between the Northern and Southern Protectorates of Nigeria in 1914 is not only truly dead but it is also well-buried. Again, if we cannot have our own constitution in the West, our own foreign embassies and our own National emblems, then it is good-bye Nigeria. If we cannot at least have the right to determine our own future as a people without any manipulation, subterfuge or input from the relentless, byzantine and barbarous Huns and Phillistines that hold sway in certain parts of this nation, then it is good-bye Nigeria. And of course, once we are forced to say "good-bye Nigeria," there will be no regrets, no turning back and no remorse. It will be a clean break and it will be a break that we are prepared to defend with the last drop of our blood. It is in the light of this that we totally reject the new-fangled and alien concept and philosophy that encourages wholesale and unrestrained racial integration. We refuse to become fully integrated with, and consequently held down by, other groups and ethnic nationalities who not only come from a different world but who also erroneously believe that they were divinely mandated to turn us into the biblical and proverbial "hewers of wood and drawers of water" in our own land. Yet they may overcome others but they will never overcome the Yoruba race and neither will we, as a people, ever bow down before them. And lest they forget, let our core "Arewa" brothers be reminded of one incontrovertible fact: that the only reason that the Yoruba nation is not on the march today is simply because a fellow Yoruba man is sitting on the throne.